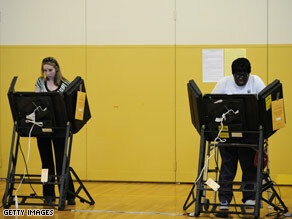 Voters cast their ballots in Oakmont, PA.
(CNN) - Race and gender may have played a role in the Democratic primary results, the exit polls show. Twenty percent of Pennsylvania Democrats said the race of a candidate played an important role in determining their vote. Clinton won those voters by nearly 20 percentage points, 59 percent to 41 percent. Twenty-one percent of Pennsylvania primary voters said the gender of a candidate was an important factor in how they voted. Clinton overwhelmingly won among those voters, 71 percent to 29 percent. This just proves my point that most people in this country are idiots. How else could bush have been elected TWICE? Please, someone try to prove me wrong. A little enlightenment for those of you suggesting that Barack Obama has had some kind of advantage due to high African American support. As of 2006, Blacks only made up 12.8% of the entire U.S. population and based on registered voters in the U.S. they represent only 11% according to Census Bureau data from the 2004 election. The voter demographic statistic does not account for party affiliation. Even if Obama were garnering 100% of the Black vote, any race based voting would always advantage the person of the majority race. Okay, so Hillary has the sniper fire thing. What Obama has against him is much worse...Rev. Wright, bitter remarks, patriotism questions, his ties with terrorists.......hmmmmm, let's take a look at what makes a person more electable and trustworthy. Her mistake pales in comparison to his shady connections and statements. Well duh, these are democrats we're talking about. For Dems, it's ALWAYS been about identity politics. People seem to forget that plenty of the states that Obama won where a majority of the people were white, voted for Obama becuase they hated Hillary. It will be interesting to see during the general elections what our true color really are. I believe all the small states that are the GOP states that voted for Obama did so to stop hillary from winning. I believe that other African Americans are voting for Obama because they do not trust Hillary Clinton, as an individual. She lies ALL THE TIME!!!! It is amazing how a state that has been so negatively affected by NAFTA, turns around and elect the wife of the President who created it. Boy what a mental blunder. Let the majority of voters in Pennsylvania have NAFTA (which has caused job losses in your state). You are so blinded by white that you can't see green. How could you be so pathetic! My goodness – let the blind lead the blind right back to the unemployment line and back to the war in IRAQ with no change. The rich Republicans are laughing at you! Wake up Pennsylvania the issue is about finances, jobs, the war, oil, and opportunities for our children's future. Thank you Hillary and Bill Clinton for dividing the democratic party beyond repair for the Republicans, boy, Pennsylvania you have been duped! Anybody out there thinks that Hillary benefit from her race!!!! Is that what you invision when you think of American democracy? I hope you are not typical of most Americans, particularly Democrats. "So the myth argued by Clinton and her supporters about Obama having the edge because he is black is false." Actually, the argument was that Obama is where he is because he's black. Which is true. Well, even with Wolf Blitzer and Cambell Brown tossing about the "black voter" suggestion for the past several days in their analyst of the pending election, why should anything other than a Hillary Clinton win be the norm... it was what CNN's efforts were directed. To continually keep the race baiting in front of the public, a majority of PA voters are white rual voters who have very little exposure to blacks. Worst of all, the state is much like Ohio... race biased as a result of its citizens ignorance of other ethnic groups (I've lived and traveled all across PA and know this for a fact). We've had two members of the same family in the presidency already, what were the results? Now we seem to be on repeat track with Hillary. Petroleum just reached $117 per barrel, Hillary just stated that she'd use military force to prevent Iran from developing a nuclear weapon. Obviously, she's prepared to ignore the U.S. Constitution, as well as International Law – As did our present Congress and G.W. Bush – Wall Street is unable to stabilize itself, and the dollar continues to lose value against every world currency that matters. Does anyone think Hillary has the means and knowledge to salvage our economy, avert another war that we can ill afford... I think not. Well Hillary, why don't you Denounce and Reject the twenty percent of racists who voted for you today. Tell them you don't want their support!!!!!!!
" ...Denounce and Reject the twenty percent of racists who voted for you today ..."
Twenty percent! Pray tell, how did you arrive at that figure, oh mentally challenged one? Then these polls prove what most of already knew: Hillary and her supporters are racist sexists. Congrats Sen. Clinton, Operation Chaos was a success I guess...PA got it wrong tonight...We need a change in this country from the old politics. THis country is in trouble and we are playing games. Wake up America before it's too late. Keep it up America with this race bs u rather vote your race or gender rather than the person best for the job and watch our country go down the toilet. We better stop promoting our golf buddies and start promoting who's best for what we need.